The liver is an organ pathologists are seeing less of, as radiologists (with multimodal imaging and triphasic CT scans) are pretty good at sorting-out many types of liver lesions. This article is an introduction to liver pathology. Liver neoplasms are dealt with in the liver neoplasms article. Medical liver diseases (e.g. viral hepatitis) is dealt with in the medical liver disease article. This is covered in the medical liver disease article. Segment I = caudate lobe. Segments II to VIII = clockwise from left upper lobe to left upper quadrant of the liver to the right of the inferior vena cava. Segment IV is divided into: IVa (superior) and IVb (inferior). The arterial flow is increased in cirrhosis. Direct sinusoids - short flow path, no detours. Branching sinusoids - direct connection between inlet and outlet; however, have branch points for detours. Interconnecting sinusoids - connect branching sinusoids. Vein; vein should be larger than the artery. Bile duct - round, has a lumen - approximately the size of the artery. Cuboidal epithelium, central nucleus, lightly basophilic cytoplasm. Irregular bile ducts without a lumen are called bile ductules; ductule implies a pathologic process. What zone has the defect? If a core biopsy is fragmented (on gross), think cirrhosis, as cirrhotic livers commonly cleave at the fibrous bands. Central vein - has a collagen collar (seen on trichrome). Hepatitis - portal inflammation, lobular inflammation, interface hepatitis (inflammation at the portal-lobule interface). Clinical correlate: AST and ALT increased. Biliary - inflammation confined to the portal tract, cholestasis. Clinical correlate: ALP and GGT increased. Clinical correlate: obese patient, changes on medical imaging (increased radiolucency on CT). Infiltrative - amyloid, monoclonal appearing lymphocytes. Congestive - dilation of portal venules, perisinusoidal fibrosis/zone III fibrosis. Clinical correlates: heart failure, imaging finding (portal vein thrombosis), medications. Clinical correlate - shock, known atherosclerosis, known cirrhosis. Mass - cellular atypia or architectural abnormality. Clinical correlate: mass on imaging. The stains ordered (initially) are dependent on the clinical history. Anything with "tumour", "mass", or "query metastasis" in the clinical history is "tumour". Everything else is assumed to be "medical". PAS-D - to detect mucin. Trichrome - to detect fibrosis/cirrhosis. Mallory trichrome: red = hepatocytes, blue/black = nuclei, green = fibrosis. Grading (0-4): 0 = none, 1: only at high power, 2: at medium power, 3: at lowest power, 4: seen without microscope. One should comment on location, i.e. macrophage (Kupffer cell) vs. periportal hepatocytes vs. centrilobular hepatocytes vs. bile ducts vs. endothelial cells. Useful for steatosis, not commonly done. CK7 - bile ducts, and bile ductules +ve. CD34 - should be -ve in normal liver. CD34 marks endothelial cells - these are not present in a healthy liver lobule. Seen in a number of conditions, e.g. autoimmune hepatitis, primary biliary cirrhosis, viral hepatitis. AKA Meyenburg complex and von Meyenburg complex. Classically associated with polycystic kidney disease (see medical liver disease). May be seen in a normal liver - incidental finding at autopsy in 0.5-5.6% of cases. Many bile ducts (tubular structures with cuboidal epithelium). Surrounded by a fibrous stroma. Not related to bile duct adenoma. Bile duct hamartoma - gross image (rsna.org). The hepatic artery branches within the liver should always be found together with a vein and bile duct. Represents: aggregation of denatured keratin filaments. Often have PMNs around 'em. Often seen in hepatocytes undergoing ballooning degeneration. Previously thought to indicate alcoholic liver disease; they are more common in alcohol. Mallory bodies - CDC/WP (WP). Mallory bodies - Mod. Pathol. (nature.com). Seen in ASH and NASH. AKA Councilman-like bodies; see notes in Councilman bodies below. Some sources say acidophilic body = councilman body, others dispute this. Location and composition must be described, e.g. zone 1, lymphocytic infiltrate. Inflammation is usually often scored (0-4; 0 = nil, 1 = mild, 2 = moderate, 3 = moderate/marked, 4 = marked). The grade (usually) approximately corresponds to the transaminases. Confluent (zone III) necrosis (0-6). May be referred to as piecemeal necrosis. Non-specific finding, i.e. seen in several conditions - e.g. viral hepatitis, autoimmune hepatitis. Inflammation disrupts the "limiting plate", i.e. there is disruption of the hepatocytes that separate the portal tracts from the lobules. More collagen than there should be. 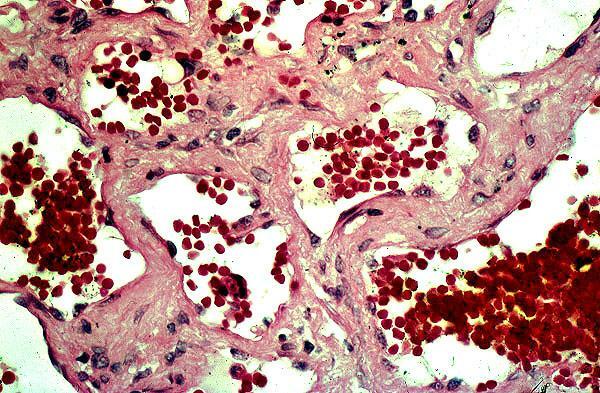 Assessment of fibrosis is based on the trichrome stain. Reticulin may be somewhat helpful. The normal reticulin pattern is chicken wire-like; in early pre-cirrhosis (Grade 1-2) the chicken wire is collapsed/flattened. The Toronto General Hospital uses the Laennec fibrosis system; named after the French chest physician. This can be considered a modification of the Batts-Ludwig system, which does not split Stage 4 into 4A, 4B and 4C. Stage 0 - no fibrosis; "loose" strands of collagen - spaces between collagen bundles. Stage 1 - minimal fibrosis - no fibrous septa, minimal "portal expansion". Stage 2 - mild fibrosis; portal expansion, +/-delicate septa, +/-sinusoidal fibrosis. Stage 3 - moderate fibrosis - several fibrous septa, not bridging. Stage 4A - mild cirrhosis/definite or probable cirrhosis - delicate septa only, fragmentation with rounded fibrous septa. Stage 4B - moderate cirrhosis - at least some broad septa. Stage 4C - severe cirrhosis - large regions of "extinction", i.e. loss of normal parenchyma. Stage 0 - nil; loose strands of collagen. Stage 1 - portal expansion (minimal), no septa. Stage 2 - portal expansion (mild), few thin septa. Stage 3 - incomplete nodules. Stage 4 - complete nodules. Many different staging schemes exist. Laennec is closely related to the Metavir scheme - which also assigns a score of 0-IV. There is a review by Theise focused on viral hepatitis. Ishak developed a 6-stage system (for research purposes). The liver is an organ of many medical diseases. Includes pre-malignant lesions, i.e. dysplastic lesions, and malignant lesions, e.g. hepatocellular carcinoma (HCC). Autosomal dominant polycystic liver disease. ↑ Fine DR, Glasser D, Hildebrandt D, Esser J, Lurie RE, Chetty N (September 1995). "An anatomic and physiological model of hepatic vascular system". J. Appl. Physiol. 79 (3): 1008–26. PMID 8567497. ↑ Koo A, Liang IY, Cheng KK (October 1975). "The terminal hepatic microcirculation in the rat". Q J Exp Physiol Cogn Med Sci 60 (4): 261–6. PMID 1041797. ↑ Fung, S. October 2007. ↑ Pollet, A. 27 May 2009. ↑ Hepatic von Meyenburg complex: a trigger of severe portal hypertension. Yoshida S, Kurokohchi K, Ueno T, Yoshino M, Shimada M, Masaki T. Liver Int. 2009 Apr;29(4):614-5. Epub 2008 Oct 14. PMID 19018981. URL: http://www.pubmedcentral.nih.gov/articlerender.fcgi?artid=2711260. Accessed on: 28 September 2009. ↑ OA. September 9, 2009. ↑ Jensen K, Gluud C. The Mallory body: morphological, clinical and experimental studies (Part 1 of a literature survey). Hepatology. 1994 Oct;20(4 Pt 1):1061-77. Review. PMID 7927209. ↑ Tiniakos DG (2009). "Liver biopsy in alcoholic and non-alcoholic steatohepatitis patients". Gastroenterol. Clin. Biol. 33 (10-11): 930–9. doi:10.1016/j.gcb.2009.05.009. PMID 19646834. ↑ URL: http://www.tissueculturemicroscopy.com/degenerations-and-certain-infiltrations.html. Accessed on: 1 February 2011. ↑ URL: http://medical-dictionary.thefreedictionary.com/cytosegresome+formations. Accessed on: 1 February 2011. ↑ URL: http://books.google.com/books?id=MrLfdTZl1dEC&pg=PA62#v=onepage&q&f=false. Accessed on: 1 February 2011. ↑ 16.0 16.1 Ishak K, Baptista A, Bianchi L, et al. (June 1995). "Histological grading and staging of chronic hepatitis". J. Hepatol. 22 (6): 696-9. PMID 7560864. ↑ Atlas of Pathology. URL: http://www.pathologyatlas.ro/viral-chronic-moderate-hepatitis.php. Accessed on: September 1, 2009. ↑ 18.0 18.1 Theise ND (February 2007). "Liver biopsy assessment in chronic viral hepatitis: a personal, practical approach". Mod. Pathol. 20 Suppl 1: S3-14. doi:10.1038/modpathol.3800693. PMID 17486049. http://www.nature.com/modpathol/journal/v20/n1s/full/3800693a.html. ↑ Batts KP, Ludwig J (December 1995). "Chronic hepatitis. An update on terminology and reporting". Am. J. Surg. Pathol. 19 (12): 1409–17. PMID 7503362. ↑ URL: http://www.pulsus.com/cddw2000/abs/080.htm. Accessed on: 9 December 2010. ↑ OA. 10 September 2009. ↑ Greenwald, J.; Heng, M. (2007). Toronto Notes for Medical Students 2007 (2007 ed.). The Toronto Notes Inc. for Medical Students Inc.. pp. DM16. ISBN 978-0968592878. ↑ Mortelé, KJ. ; Ros, PR.. "Cystic focal liver lesions in the adult: differential CT and MR imaging features.". Radiographics 21 (4): 895-910. PMID 11452064. http://radiographics.rsnajnls.org/cgi/content/abstract/21/4/895. This page was last modified on 23 June 2018, at 17:29.